This Small Penguin Is Searching For His Human. When The Lil’ One Finally Gets To Him? Absolutely Hilarious! Do you like being tickled, or do you prefer being the tickler? When you really think about it, tickling is a little weird, isn’t it? Most of us kind of love it and hate it at the same time! It makes us laugh, but most of us usually laugh and then yell ENOUGH or STOP, and then keep laughing? !This led me to wonder what is going on in our bodies when we are tickled? Apparently it signals the parts of the brain that analyze both pleasure and pressure at the same time, and we laugh as a defense mechanism to the part that is so sensitized. Accordingly, some people love being tickled, and others can’t take it…most kids kind of love it when their parents tickle them, and it is often a form of bonding. 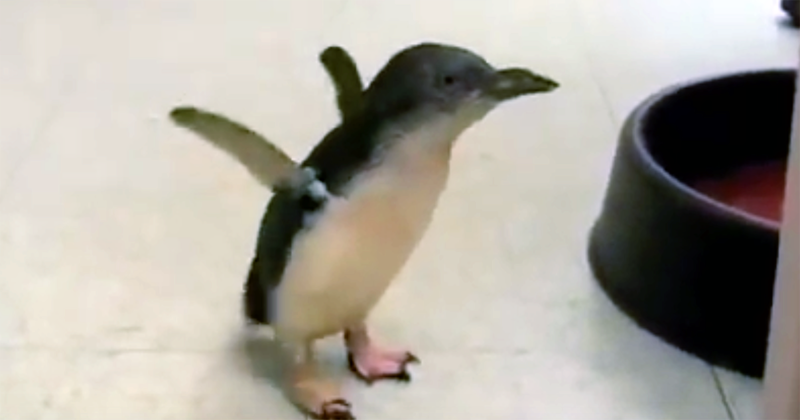 In the video you are about to watch below, Cookie the little penguin at the Cincinnati Zoo, is just like a little kid with his caretaker. Apparently Cookie loves to come over to one of his handlers each day to have his belly tickled…have you ever heard a penguin giggle? You’re in for a treat!